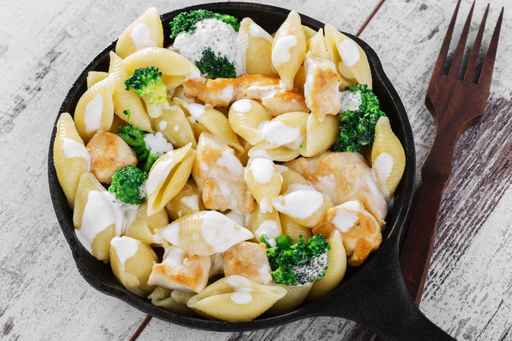 A lighter version of the classic Alfredo sauce. You’ll never know its lightened up, it tastes the same as the original! This sauce will definitely be a go-to recipe for me. Serve it with broccoli, tomatoes, chicken, or shrimp – no pasta necessary! *Note: The longer you let the sauce simmer before adding the cheese, the thicker and creamer your sauce will be. Heat a medium sized pot over medium-heat. Melt the oil in the pot and gradually whisk in the flour. Gradually add the milk. Whisk until there are no lumps and until the sauce is hot. Then add the garlic and black pepper. Continue to cook for 2 more minutes or until all ingredients are well incorporated. Serve over broccoli, chicken or anything else!